A Cheshire mummy with a boy and a girl. A blog of the fun things we do and the places we go. Oh and baking. Lots of baking. This week was chocolate week in the Great British Bake Off. I did briefly consider making a chocolate centre-piece, however spending most of the weekend at my brother in law’s wedding meant that realistically it wasn’t going to happen. 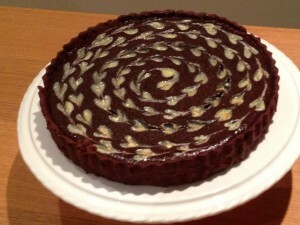 I decided to make a chocolate tart and first looked at a nice easy one with pomegranate on the Tesco Baking Ideas section. 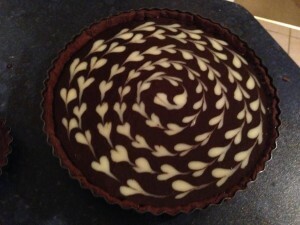 It looked nice and quick but being a glutten for punishment I eventually decided on a baked chocolate tart with a heart pattern. I adapted my normal sweet pastry ti be a chocolate pastry and made a chocolate custard which I then baked. To make the heart pattern simply pipe dots of white chocolate custard in a spiral pattern then starting at the centre of the spiral draw a skewer slowly through all the dots in the spiral to turn them into hearts. A chocolate pastry case containing a baked dark chocolate custard with white chocolate custard used for decoration. Remove the custard from the heat and continue to mix until it thickens and begins to cool. 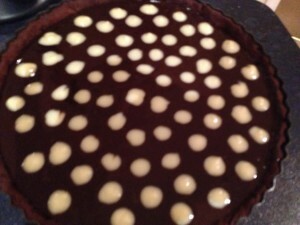 Place the white chocolate custard in a piping bag and pipe dots in a spiral from the centre to the outside of the tart. Bake for 20 minutes then turn off your oven, open the door and leave the tart in the oven for a further 10 minutes. 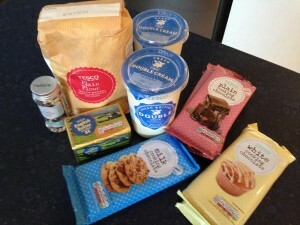 This week Tesco very kindly sent me some vouchers to help me make my baked chocolate tart, I got a great selection of baking goodies which went into making my chocolate tart. Ooh this looks and sounds so lovely. It’s amazing how effective a few dots and a skewer run through them can be – it looks sooo pretty. Looks so pretty, I have seen this design is very popular on Pinterest too!